"This is my Grandma's recipe that she gave me when I got married. 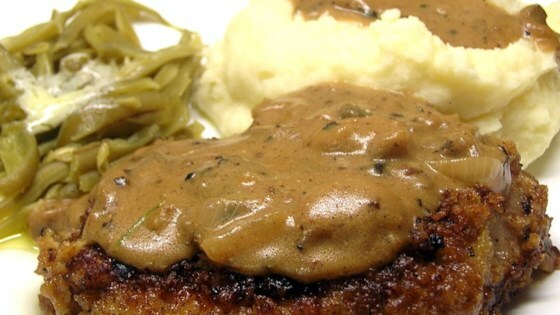 Pork chops are baked then served with a rich mushroom sauce. It takes a little bit of work, but is great for a special dinner - my husband loves it!" If you do not have a metal pan or small roasting pan, you could pour the juices back to the skillet for making the gravy. I did not have sherry on hand, so I substituted it with apple juice. The chops were very tender and tasty. Definitly worth the effort.